The Account Ability Forms Division carries a complete line of laser forms, laser kits, continuous forms, envelopes, income tax folders, Federal/State Labor Law posters and ACA, 1099 and W-2 reporting software. We accept all major credit cards, prepaid orders, and purchase orders from government agencies and educational institutions. Laser Forms are available in Standard Packs (50 Laser Cut Sheets) and Bulk Packs (500 Laser Cut Sheets). 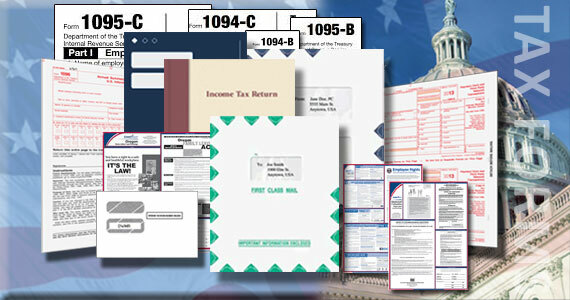 Laser kits offer an economical solution for those who prepare form W-2, 1099-R, 1099-MISC, 1099-INT or 1099-DIV. Standard kits include 50 laser cut sheets per copy; Mini kits include 25. Envelopes are optional. Window envelopes are white-wove 24lb. paper and are tinted inside for 100% confidentiality. Diagonal seam construction is compatible with most inserting equipment. Envelopes are sold by the BNDL (100 Envelopes).